1. What is Responsible Sourcing? 2. What is BES 6001 certification? 3. Why should I seek to achieve BES 6001 certification? 4. What materials are covered by BES 6001? 5. How much does certification cost? 6. How far back down the supply chain must I go? 7. What if I have suppliers from outside the EU? 8. How long does it take to get certified? 9. What is the certification process? 10. How long does the certificate last? 11. What are the benefits of BES 6001 certification? 12. How do my clients know I'm certified? 13. How do I start the certification process? 14. Where can I find out more about BES 6001? The BES 6001 standard is a means of securing certification to demonstrate through independent, third-party certification, that products certified against the scheme have been responsibly sourced. BES 6001 certification does not cover a company’s individual site or sites but is focused on the certification of individual products or product groups manufactured at one or more locations. …BES 6001 is such a scheme. Unlike many other schemes BES 6001 is not a sector specific standard; any material, product or product group can be certificated against the standard. However, in some cases individual construction product sectors have made use of the BES 6001 scheme as a framework and have developed their own sector scheme which is fully compliant and equivalent to BES 6001. An example is the Eco-Reinforcement scheme for steel reinforcement in concrete – please see www.eco-reinforcement.org. A manufacturer, seeking certification of a single product, manufactured in a single plant in the UK, would pay about £8K for the certification. This fee includes a site audit to the manufacturing plant and Head Office (usually the same location) as well as all certification costs (including uploading onto Green Book Live). This cost would increase for multiple products and/or multiple plants (as well as for manufacturing plants outside the UK). However, the cost per product certification decreases when multiple products/locations are included into a single assessment process. In addition, the organisation must have a documented system for its purchasing process and the approval of all of its suppliers who provide input materials for the product being assessed. The system must be designed to implement the criteria with respect to the BES 6001 standard. The organisation must also maintain a list of all the suppliers that provide constituent materials for the assessed product. Where supply chain organisations source constituent materials for the assessed product from outside the EU, or from states that have not declared adherence to the OECD Guidelines for Multinational Enterprises, they must undertake appropriate risk assessments and demonstrate due diligence in monitoring compliance with all the requirements of the ILO Declaration on Fundamental Principles and Rights at Work. The client prepares and sends to BRE an evidence pack (electronic, hard-copy or a mixture) to support the certification. BRE prepares and sends to the client a pre-assessment report based on the pre-assessment evidence pack. A site audit (or audits) is undertaken by BRE. BRE prepares a final report after the site audit(s) and this report is endorsed by the client. The endorsed final report is verified within BRE and a final certification score is determined. The certificate is issues to the client and details placed on Green Book Live. 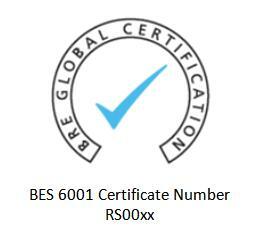 A BES 6001 certificate lasts for three years. However, at the end of each year the certificate must pass an Annual Verification process to check that essential features of the original certification are being maintained. A certificate pass level cannot be changed during an Annual verification. 12. How do my clients know I’m certified? Once the certification is completed each certificate is added to BRE’s Green Book Live website. Users can apply the site’s search facilities to identify suppliers, materials and certificate details. All certificates are downloadable from the website. Complete the application form (available on the website) and return it (with the appropriate application fee) to BRE. Email the responsible sourcing helpdesk at responsiblesourcing@bre.co.uk.